Liverpool qualifies for the knock-out stages of the Champions League by beating Napoli 1-0 in an intense game at Anfield. The Reds had to beat the Italian side either with a score of 1-0 or by two goals or more to qualify for the next round. Jurgen Klopp's men did a superb job and ensured they would in the competition. The English side were the better team from the start and got the lead when Mohamed Salah cut through Napoli's defence to slot the ball into the net through David Ospina's leg in the 34th minute of the game. The Reds got a number of good opportunities to increase their lead, but they failed to make the most of them and needed a brilliant save from their big-money goalkeeper, Alisson Becker in the final minutes of the game to go past the group stages. Liverpool are currently at top of the Premier League table and are the only unbeaten side in the League. The Reds will face Manchester United at Anfield during the weekend before making a trip to Molineux Stadium to face the Wolves. The Red's attack was getting all the limelight last season but it is their defense who is taking the team forward this campaign. 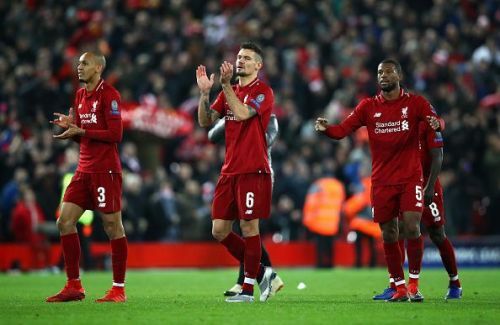 The Merseysiders now boast the best defensive record in the English top division this season, having only conceded only six goals in 16 games. On the other hand, Napoli are currently second on the Serie A table, 12 points behind the leaders Juventus. They will face Cagliari away next in the league before hosting SPAL at San Paolo. The Italians will now play in the Europa League after finishing third in the Group C.
Football fans reacted to Liverpool's victory on Twitter and here are some of the best tweets. Neymar "Liverpool won't finish top 4"
Kill the game and go through easily.